More battery life? Why not more memory, too? More juice and memory storage? Where do we sign up?! The mophie space pack is coming, and it's the sort of product that had us thinking, "This is so obvious - why didn't anyone do this sooner?" We've all known mophie for its excellent battery packs and battery cases, but with the space pack, we're getting more storage space, too. If your 16/32/64GB iPhone isn't cutting it for you, you can add an additional 16GB or 32GB, plus 1,700mAh of juice to your iPhone 5 or 5S. And the big news for mophie is that it just got the Made for iPhone certification from Apple, too, hence the big CES 2014 announcement. The mophie space pack is almost exactly like the mophie juice pack air, except it's 3mm longer and it features the new "Space" hardware inside that works in conjunction with mophie's Space iOS app. You'll feel right at home with the Space app since it's designed to look and function like a native iOS 7 app. From there, you can access your files, photos, videos and anything else you store within the mophie space pack. You can also see your usage and available space via a pie chart or a line graph that looks like the iTunes usage graph. It's really great and there is virtually no learning curve in using this thing if you're already familiar with iOS 7 and iTunes. One neat feature is the way file management is handled: you can transfer files between the iPhone and space pack, send files via e-mail, messaging, AirDrop, Dropbox and more from space pack, and you can arrange/delete/transfer files on the space pack via your computer. Mophie gave us a quick demo of the Space app, and we were impressed with just how easy it is to use. 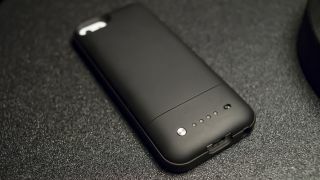 We're definitely looking forward to reviewing the mophie space pack next month. We were reminded again why we gave the mophie space pack a Best of CES 2014 award. As far as the hardware goes, it will be familiar to any mophie user with the addition of a new feature for that silver button in the back. The button will allow you to use Space when you open up the app, and the reason for the button is so that it conserves memory and battery life when you're not using Space. You just press the button again to activate it when you're in the app. We can't stress enough just how useful the mophie space pack is, and why no one has thought to do this before. The downside is that it supports only the iPhone 5/5S right now, so if you're a mophie user with a Galaxy device, you might have to wait a bit longer. The mophie space pack will become available March 14 in 1,700 mAh 16GB and 32GB variants for $149.95 and $179.95, respectively, but you can pre-order them now from mophie.